If you take a look around any woodturner's studio, you'll no doubt find a handful of different adhesives such as polyvinyl acetate, polyurethane, cyanoacrylate and epoxy. As much as we depend on adhesives to complete our projects, few of us give much thought to how they work. 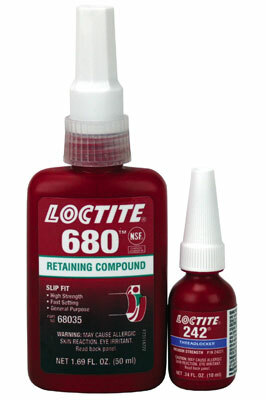 Unless we experience a failure, we are content that our adhesives will do everything we require and more. To fully understand adhesives it is handy to know about surface chemistry and fracture mechanics, as well as industrial engineering, polymer rheology and polymeric material science. However, to use adhesives successfully in your workshop you do not need to become a glue guru, but you do need to understand the basics. 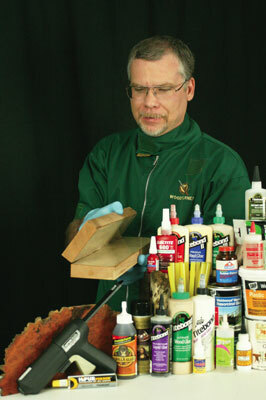 Here I will profile common adhesives and how they cure. Adhesives can be simply defined as any substance capable of holding two surfaces together by chemical or mechanical interfacial forces, or by combinations thereof. Modern adhesives are manufactured by compounding resinous base materials with additives like pigments, plasticisers, stabilisers and fillers. The term structural adhesive refers to formulations where the principal component is a thermoset polymeric resin, for example, epoxies, polyurethanes, acrylates and phenolics. Structural adhesives are rated by their shear strength, or the holding power of an overlapped joint, divided by the bond area. The term non-structural adhesive refers to adhesive formulations where the principal component is a thermoplastic resin-like polyvinyl acetate, acrylic, or cellulosic polymers. Non-structural adhesives are rated by their peel strength, or the stress necessary to cause a separation, divided by the bond width. 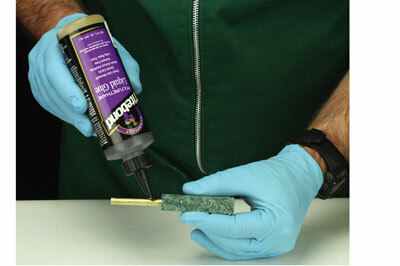 Adhesives function through a property known as adhesion. This is the attraction of two different substances, resulting from intermolecular forces between the substances. Adhesion is caused by the molecular interactions between the substrate and the adhesive, or by chemical bonding. Cohesion refers to the forces within the molecule itself, or those that connect two or more molecules in a substance. Adhesion and cohesion both contribute to the strength of a bond. 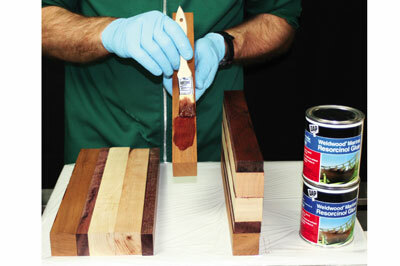 Glued joints typically fail in one of three ways. 1. Adhesive failures are evidenced by an interfacial bond failure between the adhesive and the adherend. (Note: the substrate after bonding is called the adherend). 2. Cohesive failures are evidenced by a failure within the adhesive, or the adherend, or 3. a combination failure. You may have experienced one of these failures in your workshop. If you have used a glue chuck and had the joint fail, leaving adhesive on both surfaces, you experienced a cohesive failure. If the glue chuck failed leaving one surface free of adhesive, with all of the adhesive left on the other surface, you experienced an adhesive failure. Another way the bond can fail is through adherend failures. In an adherend failure, the adherend fails before the adhesive, leaving the joint intact. This is known as a cohesive failure of the adherend. The ultimate strength of a glued joint is determined by numerous factors, including the specific type of adhesive, the quality of surface preparation, the design of the joint and the strength of the substrate. Other factors that can impact the bond include moisture, temperature (either in the ambient environment or the temperature generated during sanding), chemicals used in finishing and the internal stresses caused by seasonal movement in the wood, or the stress caused by movement of dissimilar materials like stone and wood. These contain an acrylic, or methacrylic monomer and cure due to the absence of oxygen. They are excellent for use on grub screws in boring bars to prevent loosening from shock or vibration, or to seal pipe fittings and machine fasteners. Special versions are available for plastic fasteners. Cyanoacrylate adhesives typically contain stabilisers, thickeners, soluble polymers and plasticisers to alter the viscosity, physical characteristics and performance of the formulas. Cyanoacrylate polymers spontaneously form via anionic reaction mechanisms, when their liquid precursors or monomers come into contact with a weak base, forming a high molecular weight thermoplastic material. CA's are used for bonding dense substrates in the electronics, watch making, engineering, plastics and rubber industries. In woodturning, CA's are used as a binder for crushed stone and other inlays, for filling voids, making quick glue blocks, securing parts in project kits and a thousand other uses. Epoxy adhesive resins are usually based on the diglycidyl ether of bisphenol-A, or bisphenol-F. Two-part epoxy resins polymerise (cross-link) to form thermoset polymers, when covalent bonds between the resin and the hardener form, through the reaction of the epoxide ring with the ring opening species on the hardener. Different types of hardeners are used, depending on the specific epoxy. 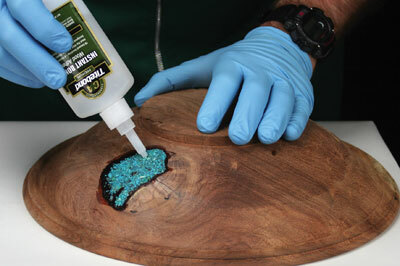 Epoxy adhesives are used to adhere wood, metals, glass, fibreglass, plastics, rubber and ceramics. In woodturning, epoxies are used for segmented constructions, bonding project blanks, as a binder for inlays, for waterproofing vessels and for gluing metal tubes into project blanks. 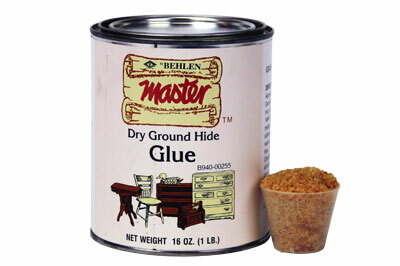 Hide glue is a protein-based adhesive made from the hide or bones of cattle, with collagen being a primary ingredient. 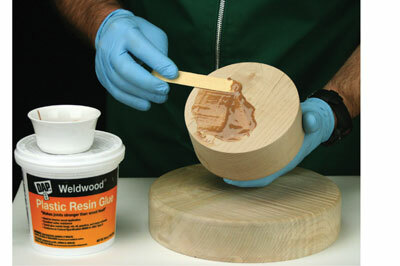 Hide glue is popular with musical instrument makers and period furniture builders, as well as some woodturners for built-up constructions and segmented work. Hot melt formulations are based on various polymers including ethylene-vinyl acetate - a random copolymer of vinyl acetate. Adhesion is provided by a combination of low glass transition, low to no crystallinity and high polarity of acetate groups. 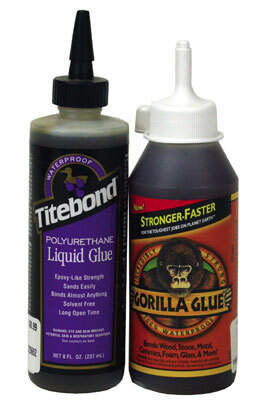 Hot melts are a 100% solids adhesive that requires heat to raise the temperature to a workable viscosity. 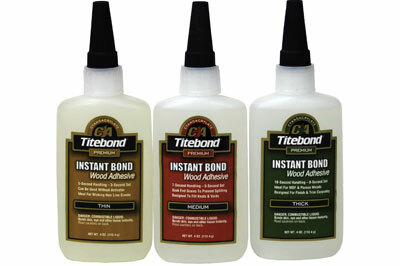 Upon cooling, the adhesive re-solidifies, creating a bond. Conventional hot melts do not chemically cross-link when cured. Newer polyurethane reactive hot melts undergo cross-linking, when residual isocyanate groups react with water after application, creating a thermoset adhesive. 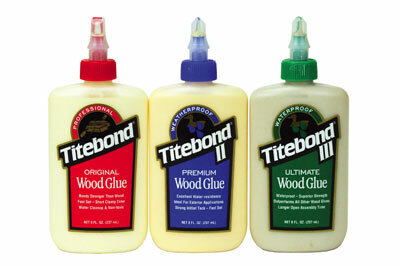 Used for light bonding of wood, metal, plastics and laminates. 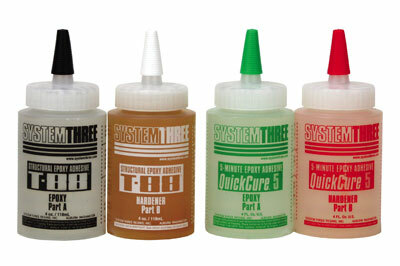 One-part PVA adhesives typically contain polyvinyl acetate, stabilisers, plasticisers and water. Polyvinyl acetate emulsion is manufactured from vinyl acetate monomer. Polyvinyl acetate is used in white glues and yellow carpenter's glues, which are commonly known as aliphatic resins. PVA cures by the evaporation of water, accompanied by the coalescence of the particles. PVAs are widely used for gluing joints in woodworking and woodturning, for bookbinding, lamination, in paper packaging and for sealing stryofoam materials. Resorcinol is a thermosetting polymer produced by a condensation polymerisation between formaldehyde (from the oxidation of hydrocarbons in the presence of a catalyst), phenol (from the oxidation of cumene) and resorcinol (from sulfonating benzene with fuming sulphuric acid and fusing the resulting benzenedisulfonic acid with caustic soda). Two-part resorcinol adhesives (liquid resin, powered catalyst) have a long and successful track record for superior bonding in load bearing timber structures, plywood laminating and for building wooden aircraft and boats. In addition, structural bonds can be achieved on many plastics, leather, natural and synthetic rubbers, primed metals, textiles and fibreboards. 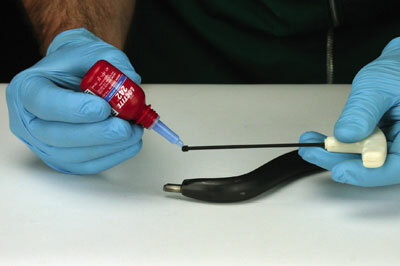 One-part adhesives consist of isocyanate containing pre-polymers, dissolved in a solvent carrier. Reaction with moisture occurs as the solvent evaporates. Unless the curing takes place inside of pressure devices, bubbles may form during curing. One-part polyurethanes are used extensively in woodworking and in woodturning for bonding wood, wood to metal and are also used for gluing metals, ceramics, stone, glass and most plastics. Two-part polyurethanes contain a polyol resin and an isocyanate hardener that are mixed by the user prior to application. Pot life varies from a few minutes to a few hours. Two-part polyurethanes are used for larger surface adhesion bonds in automotive, marine and container construction. 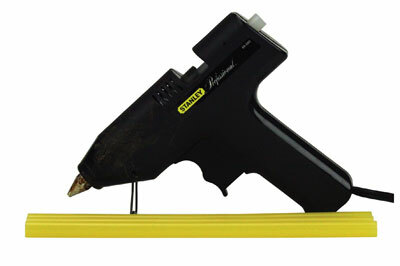 Polyurethane adhesives are also available in the form of reactive hot-melts. After application, these polyurethanes crosslink with moisture to form a heat, moisture and impact resistant adhesive. Urea-formaldehyde adhesives are thermosetting polymers produced by a condensation polymerisation reaction. This takes place between urea (derived from a reaction between liquid ammonia and liquid carbon dioxide that forms ammonium carbamate, which decomposes at low pressure into urea and water) and formaldehyde (derived through the oxidation of hydrocarbons like methanol, propane, or butane in the presence of a catalyst). Widely used to make products like plywood and particleboard with heated hydraulic presses, where dimensional uniformity and surface smoothness are important. Plastic resin glues are also used for building fly fishing rods and water skis, furniture construction, millwork, assembling hollow core doors, in aircraft construction and for adhering decorative laminates to wood.